The Art of Choosing: Light vs. Dark, originally uploaded by jenib320. For my examples today, I did three different color palettes. The first is a traditional light and dark rainbow of colors. The second is light and dark fabrics in a single color (in my case purple!). The third is a 2 color palette using light pinks and dark yellows. There are so many different patterns you can achieve with this technique! When pulling my lights I tried to focus on pastel colored fabrics. Think easter egg and baby colors. This could also include fabrics with light or white backgrounds as long as the accent colors aren't too dark. I had a little trouble with the darks, since I don't have a lot in my stash. Instead it became about finding more saturated colors, which when used with the lights will give the same effect. I avoided all fabrics with light colored backgrounds and tried to stay away from fabrics with large white accents. Here is my finished palette! These are a few fabrics I choose not to use when pulling my stacks. 1. Weekends by Erin McMorris - While this is a pastel like color, it is a tad too dark for the lights. 2. Bijoux by Heather Bailey - This is too dark for the lights and too light for the darks! 3. Modern Meadow by Joel Dewberry - This was another in the middle print, not light or dark enough for either pile. 4. Hope Valley by Denyse Schmidt - This has a light background but dark accents, doesn't fit well in either pile. 5. Sugar Snap by Melissa Averinos - Too much balance of light and dark colors. 6. Neo Geo - Light background but the accents are too dark! For this palette I pulled lots of purple fabrics, separating them into light and dark. I tried to stick to one general shade of purple, in this case red-toned purples. This would be a fun stack for a monochromatic quilt! Here I decided to choose two different colors, pulling light pinks and dark yellows. It gives the color palette a nice contrast and really makes the yellow pop. this is great -- thanks! I really love this series! Thank you for all the tips and the peek behind the scenes! It's so cool to see how other people arrive at the fabric choices they make! I've fallen in love with that last stack. It would make a completely yummy quilt! Talk about eye candy!! and I love those value quilts! OOooo...that is SOOO pretty! I think 90% of my fabrics are mediums, or like the ones you chose not to use...frustrating OFTEN! I bought a pyrex dish (white with shiny gold paint) today and thought of you. I'm going to put jewelry in it in the bathroom. You must have a considerable stash to be pulling all these lovely combo's from. Good point about the saturated colours counting as 'darks'. Perfectly explained!! You have the yummiest fabric selection....swoon!!! For some reason I don't think about fabrics in terms of lights vs. darks. Good food for thought here. I like your palate piles at the end! That bit about the pale pink making the yellow pop was very interesting..I shall bear that in mind choosing colours. Thanks for another great post! Maybe someday you could do a "Photographing Fabric" series or post!? That would be very fun, and super helpful (for me, at least!). Jeni, you gotta write this as an ebook!!! Seriously! It's so so so good! Excellent excellent post!!! This really helps guide me in the right direction when pulling fabrics! I always tend to stick with one collection, so this is a huge eye opener. 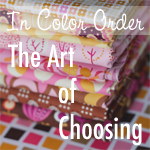 I'd love to see how to make different color combinations and how to make different shades work. Like, I love pink and green, but certain shades of each don't work that well together. Like the Gucci red and green is wayyyyy different than Christmas red and green. Make sense? This series is so interesting and helpful-thanks for all the info put together in a way that is so easy to follow.